UP Second phase polling recorded Approximately 59% of 1.92 crore voters on Saturday exercised their franchise for 59 seats spread over nine districts in the by-and-large peaceful second phase of the fiercely-fought Uttar Pradesh assembly election. The fate of 1,098 candidates, including two state party chiefs, 31 MLAs and 24 former ministers was sealed in the Electronic Voting Machines in today's exercise. 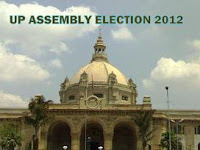 Polling for the second round, in which 59 assembly seats were up for grabs, was generally peaceful in Sant Kabir Nagar, Maharajganj, Gorakhpur, Kushinagar, Deoria, Azamgarh, Mau, Ballia and Ghazipur districts. "An estimated 59 per cent electorate cast votes in the second round," state Chief Electoral Officer Umesh Sinha told reporters here. "The polling was generally peaceful," he said adding Kushinagar district recorded the highest 63 per cent voting and Deoriya and Ballia 54 per cent each, the lowest, in round two.